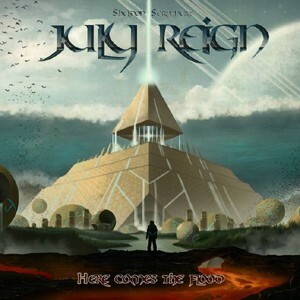 July Reign are the brainchild of guitarist Sheldon Scrivner who, having heard Evidence One, contacted vocalist Carsten "Lizard" Schulz to enquire if he was interested in collaborating with Scrivner and long-time cohort drummer Mark Duran. The evidence of that conversation is what we have here. July Reign was signed by Andrew McNeice's MelodicRock Records and 'Here Comes The Flood' was born; the record is produced by Scrivner and Rolf Munkes and is due to be released the second quarter of 2016. After a brief intro, the album kicks in with the immense 'Inferno'; a full-on guitar-led Rocker featuring fantastic work from Scrivner, a guitarist with whom I am not familiar but would love to hear more of. Anyone familiar with last year's Carsten Lizard Schulz Syndicate release 'The Day The Earth Stopped Turning' will know what a great set of pipes Carsten has and this is highlighted on 'Rage Of Pain' and 'Rest In Ruins' – two powerful hitters. The album continues in more or less the same vein with Scrivner's guitar work really standing out, not forgetting the powerful drumming of Duran. This gives the sound an amazing depth, particularly on the track 'Heart Of The Sun', a beast of a song and my personal album highlight on the album. The sound on this release is very tight and far better than most debut releases, non-more so than on the title and final track, 'Here Comes The Flood', a beautiful song capturing a trio of musicians putting in there A-game; a great way to end the album and the cue to hit play again. This really is an excellent debut release that showcases the talents of the three parts. It is well written, has great playing and the production is of the highest order. This is as good as Melodic Hard Rock gets and, in a year with so many great releases out or due out, it deserves its chance to stand with the big boys. A great new addition to the MelodicRock Records roster; here's hoping for more Reign (but not in July).